Every year I teach a watercolor class on poinsettias. We usually go to Quality Gardens on rt 228 because the green house is so beautiful and they have a wonderful selection. 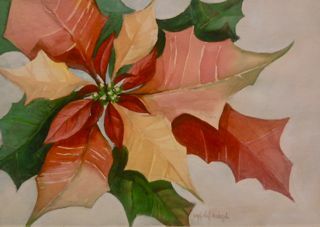 This year we decided to shop for our poinsettias there and paint in the studio. It was nice, but not the same as being in a humid greenhouse, surrounded by greenery... I may have to go just for myself. This is my demonstration on quarter sheet watercolor paper. I only had just over an hour of work time on this today. Kind of had to "go with my gut" and just work on instinct. I have to say it was fun. mat board, gesso and ground. but I will make more since the price is right.